Who doesn’t love to eat potatoes? Whether you are making grandma’s aged old casserole dish, mashing up a sweet potato recipe, or simply making a baked potato, there are limitless choices to what you can do. But are they healthy? 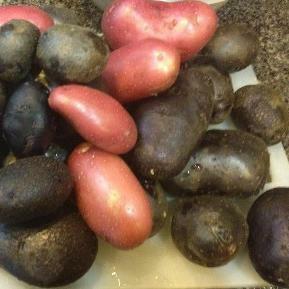 Like you, I grow potatoes in my backyard. Each year I will grow a different variety than the previous season so I am always mixing it up. Which varieties are the best for your health, and exactly how should they be implemented into a healthy eating plan? I recently asked some industry leading dietician and nutritionists what home vegetable gardeners like yourself should be looking for when it comes to health and the types of potatoes you should be growing. The consensus among the experts seems to be that you can’t go wrong growing any type of potato to add to your diet, and while some have benefits over others, it really comes down to how you prepare to eat your potatoes. Loading them up with high fatty cheeses, sour cream and the likes, increases the amount of unhealthy fats you take in and neutralizes any of the benefits that your home grown potatoes provide. Mike Podlesny is the author of Vegetable Gardening for the Average Person: A Guide to Vegetable Gardening for the rest of us. Be sure to join Mike`s vegetable seeds mailing list. Every year I try to add something new to my vegetable gardening experience. Whether it is building a new raised bed, growing a different variety of fruit, vegetable or herb, I am huge fan that expanding one’s vegetable gardening knowledge will go a long way to a more successful garden. Over the past three years I have made a conscience effort to add a new fruit. Three years ago I made an attempt at raspberries which did not pan out very well so I will put them back on the growing block for next season. However the one fruit that seems to be doing well are my grapes. I purchased two different varieties at the end of last season on closeout at a local home and garden center for a buck a piece. This season they really took off. The vines have grown thick and healthy and have taken over the trellis that I set up for them. The questions that popped into my own head were “what do I do now?” Do I trim it back? If so, when? Should I expand my trellis and did I even plant the correct variety to begin with? I mean, after all I made a huge investment of a dollar (ok it’s not that huge). When it comes to growing grapes where else would you to turn for expert advice then someone who grows them for a living. 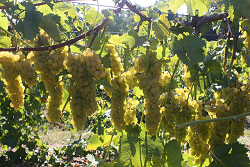 John G. Kramb of Adams County Winery in Orrtana, PA, started producing wine from grapes in 1998. Today they produce over 30,000 gallons of wine from their 15 acres worth of grapes they grow on their farm. As of right now in my second year with the grape vines I purchased I have not reaped any fruits of my labor so to speak. Mr. Kramb says that is normal. He doesn’t expect any significant production until after the third year. 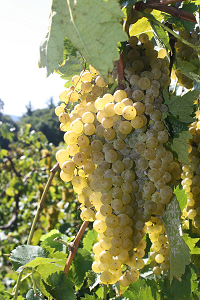 In fact if the grape vine does produce any fruit prior to the third year that fruit is removed so the plant can develop a stronger root system. As far as pruning the vine is concerned, he said you should wait until all of the leaves have fallen off and if you live in a colder climate wait until the spring to make sure your plant has not experienced any winter damage. On a final note, when in doubt check with your local agricultural extension agent to get advice on varieties that should grow well in your area and don’t forget to ask commercial growers in your area to see what they do to get some advice from them. But above all, be patient. Good quality grapes takes a few seasons. Mike Podlesny is the owner of Mike the Gardener Enterprises, LLC, the exclusive home for the Seeds of the Month Club, which has appeared on NBC, ABC and MSN Money as a great way for consumers to save money. Roger Marshall, author of the book How to Build Your Own Greenhouse, agrees. Roger does his gardening in Rhode Island, and having been in the great Ocean State myself during a winter a few years ago, I know it can get very cold there. In the coldest of winter months of January and February, Roger has grown various greens and broccoli in a cold frame he built himself out of some old storm windows. He recommends a number of ways you can build easy to use cold frames, such as using straw and hay bales as well as using a side of a wall of your house. 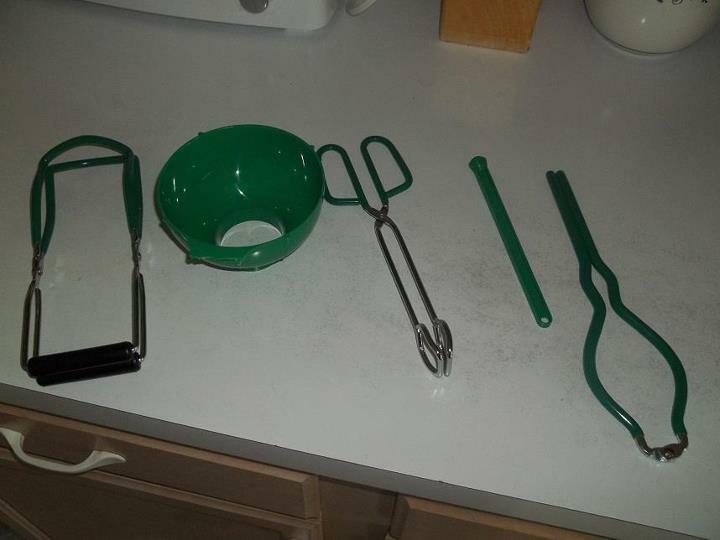 You simply use these items to form a garden bed. Just be sure to cover with some clear plastic to let the light in but keep the cold out yet easy enough to open up for daytime ventilation. If you were thinking about hanging up your gardening gloves for the winter, think again. 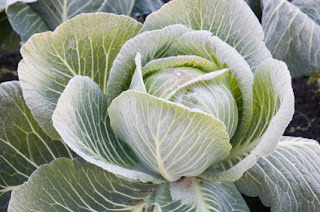 Cold frame gardening is a great way to keep going. Use some of these tips above to create your own cold frame and have a winter garden for yourself. Mike Podlesny is the author of Vegetable Gardening for the Average Person: A Guide to Vegetable Gardening for the Rest of Us. He has appeared on NBC, ABC and Fox helping vegetable gardeners save money through the Seeds of the Month Club. Your journey from tomato seed to edible tomato began a few months ago. Now you have so many tomatoes you aren’t sure what to do with all of them. You have given so many to the neighbors that when they see you coming they close their front doors and hide, because they don’t want anymore. Ok, maybe it’s not that bad, but you get the point. One of the best ways to preserve your tomato harvest is to learn some canning methods. Particularly the water bath canning method. I will get to more on that in a moment. This method allows you to take your tomatoes and safely preserve them for consumption later on. If done correctly, they could last for up to one year. But if you really want to maximize your time, efforts and tomato harvest, then combine the canning process with pre-made dishes. In other words, before you can your tomatoes, turn them into something first, i.e. tomato sauce, tomato soup, or as is the case with this article, salsa. What you choose is up to you, but it will definitely make things easier later on down the line. Today I am focusing in on salsa. You can add it to just about anything, or nothing at all and use it as a dip for chips and tortillas. When you make a salsa from your own home grown tomatoes, it really tastes that much better. So let’s begin. I would like to say that I am a seasoned chef and conjured up my own salsa recipe, however I did not. I use a pre-made mix that requires adding nothing more than my own tomatoes and distilled vinegar. 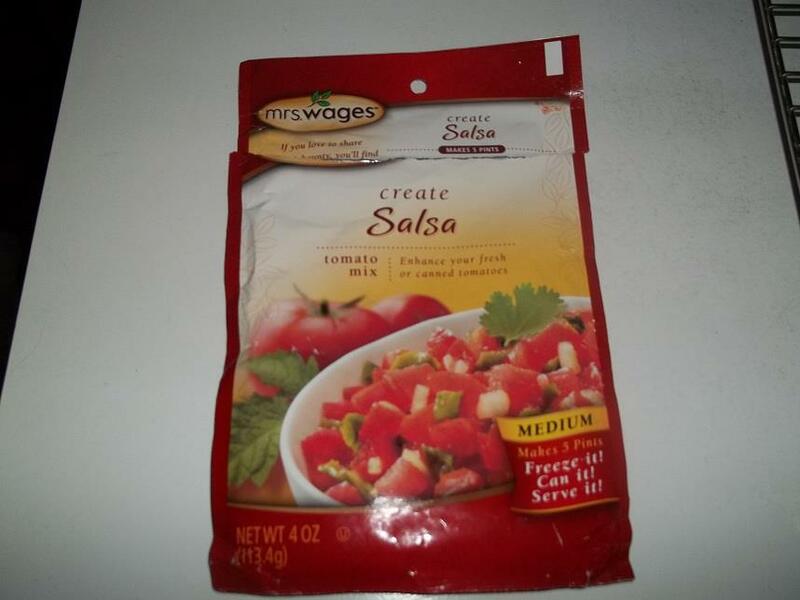 As shown in the picture, I used Mrs. Wages salsa mix. 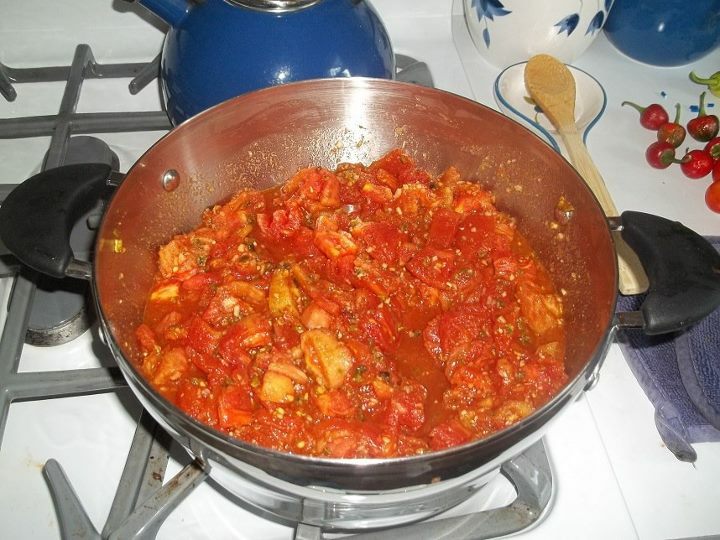 A nice and easy recipe that anyone with 10 minutes and a working stove can make (and tomatoes of course). I chose the mild/medium salsa as I am not one that likes things too spicy, however, even that had a bit of a kick to it. At least to me anyway. Follow the instructions on the back to prepare the mix. The only thing you will need to add is vinegar and your tomatoes. So below I gave a brief example of how to get your tomatoes started. I used a variety of tomatoes to make up my salsa. This season I grew beefsteak, romas and cherry. If you look in the photo you will see a combination of all three, with a bit more romas then the others. Most people use only romas because they are easy to cut the core out and keep the seeds out of their salsa mix. The choice is up to you. 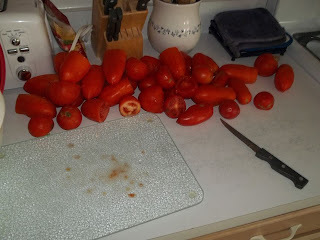 To get your tomatoes ready for the salsa mix, you will first need to blanch them. This makes removing the skins (which you don't want), much much easier. Blanching is simply the process of putting your tomatoes into boiling water for 45 seconds, then removing them and immediately submerging them into ice water. Once the blanching process has been completed, move the tomatoes to an area with enough space and start removing the skins by hand. You should not have to use a knife or any other tool to remove the skins. Save the knife for the dicing step. If you do, place the tomato back into the boiling water for a little bit longer. After you have "skinned" the tomatoes, use a sharp knife to dice them. Cut the tomatoes into small cubes then place the diced tomatoes into your salsa mix. Follow the instructions on the back of the pack, which is bringing the tomato mixture to a boil, then reducing the heat and letting it simmer for 10 minutes. If you plan on canning your salsa for long term storage, then please read the rest of this article. 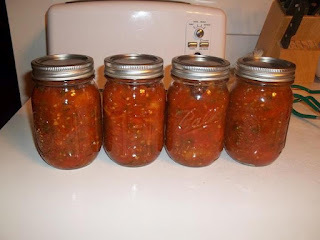 If you plan on consuming your salsa within the next few weeks, then you can skip the canning portion and read the part of putting the salsa into canning jars. 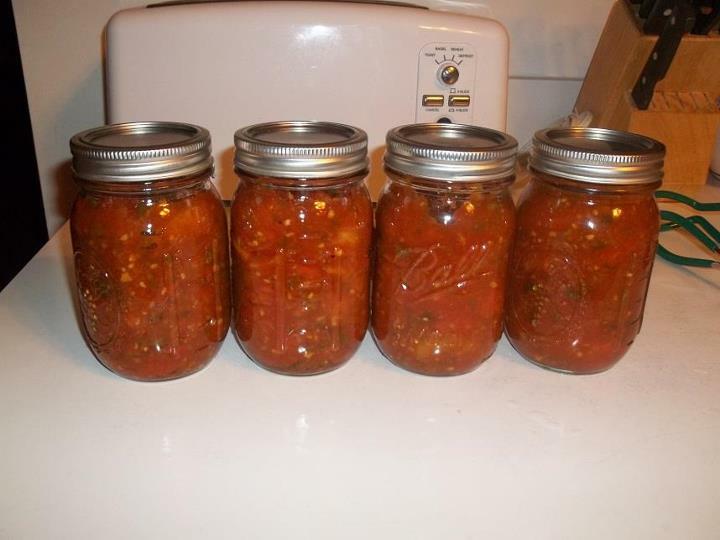 Before you begin the above tomato salsa mix, get your canning supplies ready. 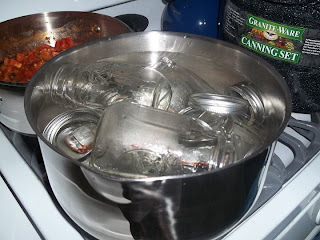 Get your water bath going over high heat to get it to a boil and another large pot on a medium to low heat that you will submerge your jars, lids and bands into to sterilize. I used pint sized jars and made enough to fill four and a half pints. I felt using smaller jars made it easier to consume in reasonable sized quantities later on. Get your other canning tools ready. They normally consist of a jar grabber, tongs, a magnet, funnel and jar tightener. It is a great source of information on diving into the world of canning and food preservation. After your mix has finished simmering, use the funnel and a ladle to pour the mixture into one of your canning jars leaving a quarter inch of head space. That is the space from the top of the jar to the top of the salsa inside the jar. Once you have your jars filled and sealed with a lid and band, submerge your filled jars into your boiling water bath. Once the water returns to a rolling boil, then the clock begins. Boil your jars for 45 minutes. After 45 minutes, use your jar grabbers to remove the jars and place them on a cooling rack or towel to let cool. You will know that your jars properly sealed if you hear them begin to pop. That can take anywhere from a few minutes to a few hours depending on the contents of the jar. If you find that your jar did not seal properly you can either try again, or place that jar in the fridge and consume within a couple of weeks. And that's it! You now have tasty salsa. You can do many things to and for your home vegetable garden to make it easier on yourself to maintain. Such things include a sprinkler system for watering and mulches for weed prevention. With that said there is one creature that you and your garden should not be without for such maintenance, and that is the worm. Well worms, plural, to be exact. Worms provide a plethora of benefits. For instance, as they move about your soil they will consume a variety of things from organic matter, to the clay, silt and so on, and in turn give you castings. These castings, also called vermicompost, are filled with some of the greatest nutrients your plants will need to grow. Besides the nutrients the castings provide for your soil and your plants, they are also good for making your soil more granular (more crumbly), which helps improve your soil's structure allowing air and water to move more freely. As worms move around your soil, they also create tunnels. These tunnels help aerate the soil underneath, and that is beneficial to plant roots, giving them a looser soil to grow and expand. "Soil that has been well worked by worms can take in water four times faster than soil that hasn't," writes Edward C. Smith, in his book The Vegetable Gardener's Bible. "This reduces runoff and prevents water loss through evaporation from puddles that form when soil cannot absorb rainfall quickly enough." To see if your soil has enough worms you can do a simple worm count by digging an area in your garden, one foot wide by one foot long by a half foot deep. Turn the soil over and look for worms. If you don't find any, your soil has issues. You are looking for more than a dozen worms in that sized area that you dug up. Don't panic if you don't find any or less than a dozen, it just means you have some work to do, to create an environment that is suitable for them. Adding in plenty of organic matter (i.e. grass clippings, leaves, coffee grinds, egg shells etc.) will go a long way to building a healthy worm population. This will take some time and you must be consistent, because as soon as you stop feeding the worms, they are out of there. You can speed this process up a little bit by purchasing some red wigglers and adding them to your soil. 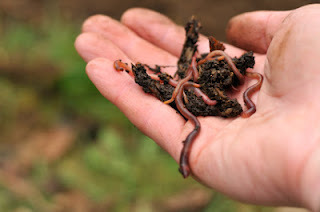 Even if you purchase the worms and add them in, you will still need to add organic matter to the soil to keep feeding them, otherwise they will leave as well. As long as you keep adding organic matter to your soil, you will be fine. Spinach is one of the healthiest leafy greens you can eat. It is loaded with plenty of vitamins and minerals that all doctors and nutritionists would recommend. So why not add this healthy tasty treat to your home vegetable garden? Besides its health benefits, spinach is easy to grow from seed and in many areas of the world and you can get many harvests from the same plant as well as planting during the spring and winter months. As long as temperatures are cool to moderate, you will be able to grow spinach. Don’t fear if you live in climates where it gets very cold, you can always add in a cold frame to protect your plants from the frigid winds. However if it gets too hot, 85 degrees or above, you are going to have issues with keeping the plants going if the temperatures remain at that level. Make sure you pick a spot where it gets at least 5 hours of sunlight daily. More would be better, but many varieties tolerate light shade as well, which makes spinach a perfect fall crop when the days are shorter. Plant your spinach seeds no deeper than a half inch. Any deeper and they may have trouble during the germination process. Plant multiple seeds together, then once they germinate thin out the plants to one plant per every six inches. If you find that you germinated more then your space allows, be sure to toss the extras into your next salad. They taste great! When the outer leaves on your spinach plants reach six to eight inches in length they are ready to harvest. Simply cut them off with a sharp pair of scissors. Do not pull out the entire plant as it will keep producing as long as you only harvest the leaves. This allows those with limited space to yield plenty of spinach from just a few plants. Expect your spinach plants, when you grow them directly from seed to take anywhere from 45 to 70 days to fully mature. Sometimes sooner under optimal conditions. Spinach is a great source of calcium, iron, vitamins A, B and Niacin. If you were looking to get more of these nutrients into your healthy eating plan, be sure to grow some spinach from seeds right in your backyard. Many vegetable gardeners get bummed out because Labor Day marks the end of summer and that usually means, cooler weather is not too far off, translating into the end of growing fresh fruits and vegetables. However, gardening in the cooler months is just as fun as the summer months. The cooler months yield a chance to grow all sorts of great veggies. Carrots, radish, kale, peas, lettuce, spinach, beets, turnips and broccoli make up just a few of the many choices you have. Throw in a cold frame over your garden beds and your growing possibilities become nearly limitless. Of course, growing tomatoes, beans, peppers and cucumbers more than likely won’t work in your area when the temps begin to drop, autumn is great time to continue to grow. For many of you, like me, you will need to remove some of your summer plants. If they are still producing, you of course would not do this, but if they are not, now is a good time, to go ahead and discard them into your compost pile. Now that you have an area to plant in, you will want to replenish the ground with plenty of nutrients, and the best way to do that, is mixing in some of your finished compost. The more you have to mix in, the better off you will be. Of course, if you don’t have enough compost to go around, or you did not get one started this year, there are plenty of organic fertilizers on the market that you can use to help along with your growing process. One of my favorites is Annie Haven’s Authentic manure tea bags. They are small tea bag looking products filled with seasoned manure that you steep in water, then water your plants with. It works great, and is fairly inexpensive for how much use you get out of the tea bags. So before you give up on your gardening for the season and grab some of those vegetable seeds that work well in the early spring, because they are going to do great in the fall as well! Mike Podlesny is the author of Vegetable Gardening for the Average Person: A Guide to Vegetable Gardening for the rest of us, the moderator for the largest vegetable gardening page on Facebook and creator of the monthly Seeds Club.